The F-15 Eagle is an all-weather, extremely maneuverable, tactical fighter designed to gain and maintain air superiority in aerial combat. The first F-15A flight was made on 27 July, 1972 and the first aircraft was delivered to the Air Force on November 14, 1974. No USAF aircraft design solely conceived as an air superiority fighter had become reality since the F-86 Sabre jet. The F-15’s superior maneuverability and acceleration are achieved through high engine thrust-to-weight ratio and low wing loading. These factors plus highly skilled pilots have allowed the F-15 to achieve a perfect combat record of 101 victories and zero defeats. During the past three decades, 1,500 F-15s have been built in five models and are operated today by the US Air Force, the Air National Guard and several foreign countries. 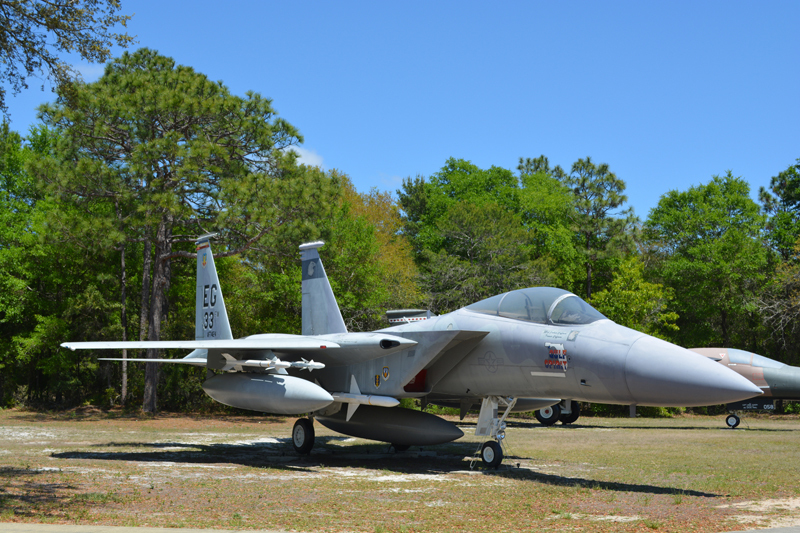 This F-15A S/N 74-0124 was last flown by the 4484th Test Squadron (TAC) at Eglin AFB, FL. It is being depicted as the 33d Fighter Wing Commander’s aircraft. During Operation Desert Storm, the 33d Fighter Wing led all other units with the number of enemy aircraft shot down (16). During Operation Desert Storm the F-15 kill ratio was 26 – 0, this is a tribute to an outstanding aircraft and the personnel that fly and maintain it.